The inaugural Health Hackathon brought together healthcare professionals, techies and entrepreneurs to solve challenges in three tracks: Improving the Quality of Maternal and Child Health, Controlling Non-communicable Diseases and Increasing Access to Care. Dr. Bonventure Ameyo Masakhwe lead a team that developed iVaccinate, a mobile app that got honorary mention in the 'Improving quality of maternal and child health track'. iVaccinate reminds mothers to follow their ANC and immunization schedules for their babies based on the date of last menstrual period (mother) and date of birth (baby) as well as providing general maternal and child health literacy to families through an API platform supporting GIS mapping and linking and referral of expectant mothers, health providers including community health units and health facilities as well as supporting USSD automated SMS and voice. The platform also allows a group of mothers linked to a community health unit, locality or facility mapped by Google technology to access a shareable digital blood pressure machine for early detection of preeclampsia, as well as a non-shared digital thermometer for early neonatal infections in the baby. These two tools are simple to use at home by the mothers themselves and can promptly detect preeclampsia and sepsis which cause a quarter of the 16-22 maternal deaths that occur daily in Kenya, and 35% of early neonatal deaths that result from neonatal infections. 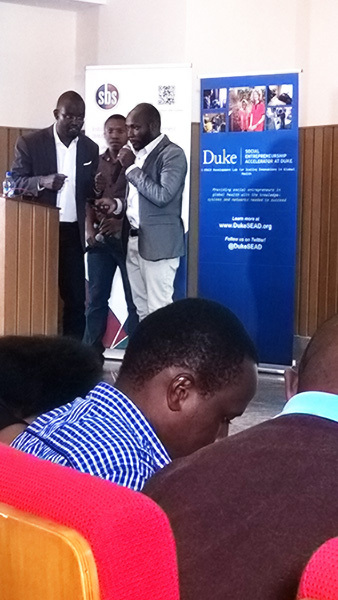 The event was organized by Duke University's Social Entrepreneurship Accelerator at Duke (SEAD) and hosted by Strathmore Business School. Sponsors included BD, Philips, Merck, Google, AHTI, and institutional partners: The iHub, @iLab Africa and Strathmore Business School.